Hi everyone here is one of the new stamp sets in the catalogue called Pop of Paradise which you can find on page 85 in the new catalogue. I used Melon Mambo for the card base and Whisper White for the mat, melon mambo ink pad to stamp the large leaves and Emerald Envy ink pad for the small leaves, for the pineapples I used Stampin'Up markers Delightful Dijon and Cucumber Crush. Using 2 Oval Framelits (not the new ones) to cut out Whisper White for stamping the Flamingo on in Peekaboo Peach (I wiped off ink from the legs and used the Tip Top Taupe marker) cut a larger oval from Peekaboo Peach card stock and adhere them together using tombow or snail then add dimensionals on the back to adhere to front of card, for the large leaf on top of ovals I used Peekaboo Peach ink pad and Emerald Envy ink pad stamping off once to get the lighter colour. 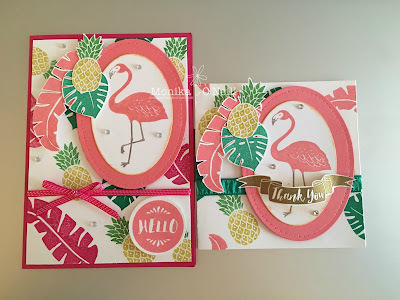 For the Hello I used Peekaboo Peach ink pad and for the Thank You I embossed with gold embossing powder. To finish of I used Melon Mambo Ribbon and Emerald Envy Ruched Ribbon on the thank you card. For the thank you card I used the Note Card and Envelope set in Whisper White. I have listed the products below to make it easier for you to order anything just click on the item and it will take you to my shop.